« TIME MARCHES ON-WE’RE ALLOWED INTO THE GARDENS! Today, I’d like to talk about swarming bees! It is a bit scary to see something like this hanging from a tree in your yard, but NOT TO FEAR! Bees that are swarming are busy looking for a new home. Bees sting in order to protect their honey (food source) or eggs. They don’t have either in the swarm, so they tend to be rather placid. The bees that leave the swarm are scouts looking for a new home. Perhaps in a hollow tree or wood pile, or somewhere. In the springtime, the hive may become overcrowded, which is unhealthy for the bees. There are new queen bee eggs about to hatch out. The old queen is the one who leads the swarm to new “quarters”, so it’s important that there are queen bee eggs left in the old hive. But the bees figure that out. Bee keepers also know how to deal with that (we hope). The only time you should be concerned is if they are INSIDE the walls of your house. 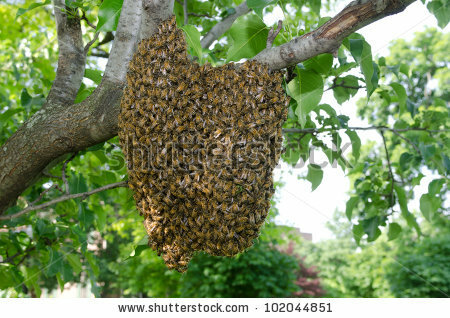 Then if they decide to settle there…they WILL have a hive, with honey and eggs…so watch out! Then you WILL need an exterminator. Here at Horizon House, we probably won’t encounter this early spring happening, but I’ll bet that many of you gardeners have dealt with a swarm or two in your lifetime. Maybe it would be interesting to re-visit this phenomenon and really find out what is going on here! Here is a little video about bee keeping that you might find interesting.